Bollywood actress and Wildlife Trust of India brand ambassador Dia Mirza launched Gaj Yatra campaign to save elephants. The campaign was launched at the Shree Siddhivinayak Temple in Mumbai on Sunday. Gaj Yatra is a campaign that aims to raise awareness about the shrinking space for India's wild elephants and the importance of securing elephant corridors. Gaj Yatra is partnered with the International Fund for Animal Welfare (IFAW), is the biggest event ever planned around India's wild elephants. It will take the form of a roadshow that will move through 12 elephant range states over the next 15 months, with elephant-sized artworks from waste materials created by local artists and craftsmen as the centrepiece. Speaking at the event, Mirza who was also the host for the event said, "To understand that if we don't bring ecological balance with our nature and wildlife then there will be no progress for our country. If we want rivers, forests, clean air and water then we should protect our forest and protect the animals that are living in it. The elephant that is a keystone species, we should protect their habitat because if we do that we indirectly protect all the other wildlife. So when we protect our wildlife, we save our forests." She further briefed that there will be around 101 huge elephant installation across the country which will be made by waste materials. She says that Gaj Yatra is a people's movement and urges people to pledges to protect and co-exist with the wildlife and the environment. 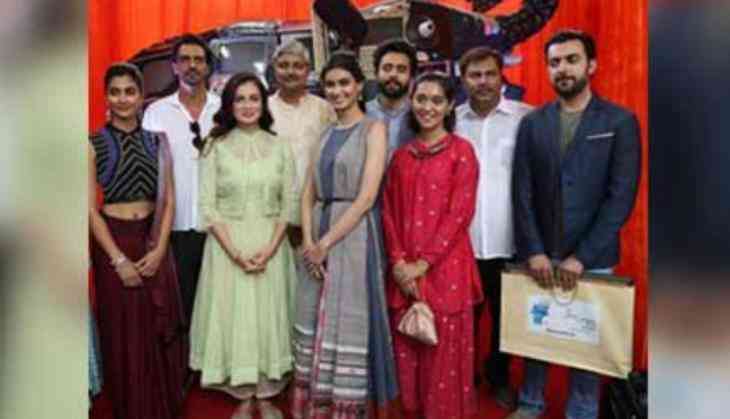 Actor Arjun Rampal who was present at the campaign said, "We have taken every right from the environment and the wildlife and in the process, we have indirectly led ourselves into trouble. So if you are really greedy and humans that you are, it's time to give back because if you don't give back then we are going to be destroyed, the planet is going to be destroyed." "So be the greediest human being and join our herd and help open these corridors which are very important for our survival and also think about our younger generations," Rampal added. Celebrities like Diana Penty, Jackky Bhagnani, Pooja Hedge and Sayani Gupta was present at the event. Minister of Railways Suresh Prabhu was the chief guest.